Amp New Music joins with the Ekmeles Vocal Ensemble on the US premiere of Luigi Nono’s Quando stanno morendo, diario polacco n. 2 in a program of compositions by Italian and American composers involving voices, instruments and electronics. 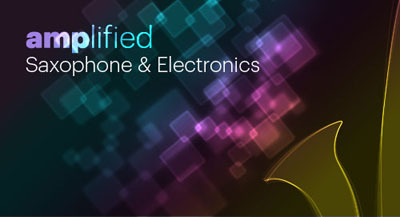 Amplified. New music for saxophone and electronics presented by Amp on tour with stops in NYC, Atlanta, and Boston. Compositions include works of the European avant-garde highlighted by the US premiere of Stockhausen’s Edentia, as well as pieces by Amp co-directors, Adam Mirza and Gregory Cornelius. Amplified features saxophonist Michael Ibrahim and sound projection by Gregory Cornelius. The centerpiece of the tour is the US premiere of Karlheinz Stockhausen’s Edentia for soprano saxophone and electronic music, the 20th Hour from the cycle Klang - the 24 Hours of the Day. 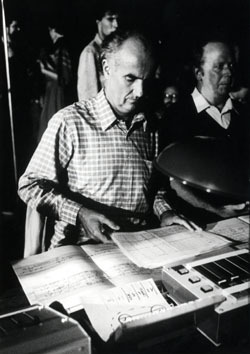 Edentia, composed in 2007, is one of Stockhausen’s final compositions. Like many of his later works it defies easy categorization. Looped electronic melodies spiral through space and time (spatialized for 8 loudspeakers at the Freiburg Experimental Studio for Acoustic Art) in evocation, perhaps, of the cosmic voice, while through this mesmerizing vortex rises the quizzical saxophone. Juventas Music ends their 2009-2010 season with four performances of 3 x 3 = ∞, an opera by Peter Gilbert and Karola Obermüller. 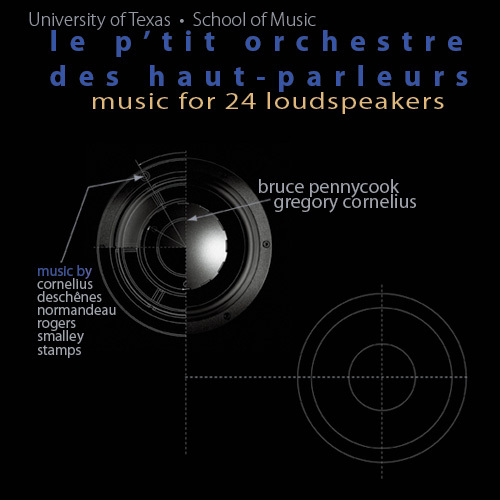 The score includes an electroacoustic component that uses Max/MSP, which I am working with the ensemble to realize. 3 x 3 = ∞ explores the human cost of genocide as seen through hindsight. On an otherwise ordinary day, a researcher (Frau A) is stunned when a tinnitus in her ear morphs into a mysterious message. The message seems to be connected to an image of three people and it tells her that she can help explain why these people have disappeared, that she can bring the truth to light and see justice served. As she investigates the human-rights catastrophe surrounding their tragedy, voices from the past take on a life of their own and begin to intertwine with repressed memories of her own. The deeper she probes, the more personally she seems to be involved. Is she losing her grip on reality or was she actually there? What are the implications if she is a survivor? Is she guilty of allowing evils to unfold? Tina Hartmann's libretto weaves a mysterious triangle of victims, perpetrators and survivors. At its center, a lost woman struggles to reconcile the past with the present and to answer the question, how does one live on? A reporter researching missing people from the Holocaust becomes so consumed by history that she begins to imagine she herself was involved. Is she losing her grip on reality or was she actually there? In the span of a week, two events have stunned the artistic side of my life. The most recent made such a strong impact that I couldn't just sit idle. Never once in the six years that I have maintained this website have I felt the need to use this space as a soapbox to report an injustice. Until now. A couple weeks ago, I emailed David Justin asking him to send me a copy of Fray, a dance work created in collaboration with David (choreography), Rosalyn Nasky (dance), Leanne Zacharias (cello), and myself (video) during the first half of 2008 and premiered at the Big Range Festival in Austin, Texas. Leanne introduced me to the project when she approached me on behalf of David asking, "How would someone go about creating an iTunes visualizer effect that instead of responding to a recording, responds to the sound of Leanne performing György Ligeti's two-movement Sonata for Solo Cello?" After I suggested a few options, David asked me if I would be willing to create interactive visuals to be projected behind Leanne as she performed. Leanne and I are close friends and have collaborated on several previous occassions, so even though time was in short supply, I said yes. I gave it my best shot, but before the first performance in late January, David with little resistance from me, decided that the visuals were not working and should be scrapped. While frustrated, I could see where he was coming from, so I accepted the decision. At that point as far as I was concerned, the project was dead. With cellist Leanne Zacharias barefoot, black-clad and on a short wooden platform, dancer Rosalyn Nasky executed quick precise ballet moves alternating with striking poses. A second short platform with a video monitor slowly rolled around the stage, the monitor flickering images that. Fray was pure, intelligent abstraction of music, dance form and video technique all cogently and beautifully put together. Even though I felt satisfied that I had given as much as I could to the project, I was aware that my component could use some polish and possibly some re-thinking. I also knew that the last few weeks leading up to the premiere were trying for everyone involved. Engaged and employed, life had stablized. During a trip to visit a friend in NYC, a conversation triggered me to wonder whether Fray was still a living work or whether it was resigned to a closet to gather cobwebs. After returning to Boston, I sent an email (8/15/09) to David to inquire about the work's status and to ask him to send a recording so that I could see the end result. No response. We re-shot all of the video for this upcoming performance. I wanted to reinforce the inner life of the both dance and music by strengthening the bond between them. I have done this in two ways. One the video is of Roz performing much of the choreography she will perform live. How this visual information is match and juxtaposed will have an impact on how we perceive the dancers emotional location at any moment and her relation to the music. It is important to add though, that because it is integrated into live performance - it will never be the same relationship twice. The second element I have added to strengthen the connections is color. Before, the cello was the only true, rich, warm color on stage. I have now balanced the stage by treating the video with a blend of color theory and ethereal texture. My hope is that this addition reveals a dialogue between the instrument and the video in a way that parallels the monochromatic relationship between the musician and the dancer. You have to be kidding! My whole contribution dismissed without even a phone call or an email. I found my hands shaking as I sat frustrated, disappointed, and infuriated. The 100+ hours that I spent working on a project that I barely received a dime for had gone for nought. Never once during my interactions with David had I given the impression that our arrangement was pro-bono work-for-hire. In my mind, the project was a collaboration. The trauma of being blindsided leaves me pondering the question: what are the ground rules that oversee an artistic collaboration? And, how does an artist know that the collaboration is not an attempt to aqcuire free labor, but is actually legitimate? For most, drafting a legal contract at the outset seems antithetical to the spirit of artistic collaboration. And, any form of written agreement would be difficult to request from a friend. So in the absence of a tangible defining document, the values and ideals of the involved individuals are left to establish the boundaries. The perceived value of an artistic work is not based only on economics. While public demand, competition, and marketing all play a role in both the creation and the initial dissemination of a work, other factors impact the long-term value. A compelling work captivates audiences by painting a picture of an artist's inner workings (intellectual and emotional) while reflecting life in a more general sense. Producing such a work requires intensity, awareness, and a single-mindedness, which together builds an attachment between the work and the work's creator. This close connection can lead to extraordinary behavior, especially when an artist has joined forces with others. Acts of blatant disregard, severed relationships, and projects run aground are not uncommon resulting in works of art that simply fade into the ether. Challenges not withstanding, the underlying authorship of a work completed through collaboration, which requires agreements and compromises, remains shared between all collaborators. Deciding whether to stick to his/her own artistic beliefs or to give ground and make compromises to move a project forward is difficult. Not compromising has the potential to collapse the project or fray relationships. Compromises also have the potential to stretch and challenge strongly held beliefs, which benefits an artist's life and work by expanding his/her mind not unlike how traveling spurs artistic growth. Each compromise splits the authorship of the work. Even if one person holds a more prominent or leadership role, by accepting the ideas of others, the authorship is also shared. Does an individual have the right to modify a collaborative work without notifying the rest of the group? By rejecting my contribution and moving in a different direction without asking, David Justin has ignored that I am part author of Fray. And, regardless of whether or not there are legitimate artistic reasons for doing so, his behavior was inappropriate. The ironic aspect of the situation is that if I had not been devoting my time and energy to Fray while I was in residence at the University of Birmingham in England, I would have had more time to work on another project that has recently went south. Frustrated with my lack of progress, Michael Straus decided to cancel the commission of a work for saxophone and video that he requested over 2½ years ago. The circumstances of this situation are quite different from the other one, essentially I did not hold up my end of the bargain. I did not meet the requirements of the commission in a timely manner for which, while disappointing, I have no one to blame except myself. 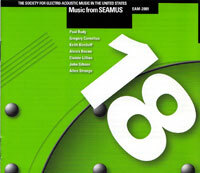 Music from SEAMUS Volume 18 has been released. The compilation features a number of notable works from the 2008 SEAMUS National Conference including Earth and Green. It is an honor to have my work included. The CD is available for purchase directly from SEAMUS. In other news, my life has undergone quite a few changes since my last post. The most exciting change will take full effect in about six weeks when Ashley Addington and I get married. Ashley is a fantastic flutist who has brought stability to my life. Another major change is that I now have proper employment. For the last year, I have been working for Boston University as a web services consultant. The majority of my time is spent working with a small team on the development of a new service that provides a content management system built using WordPress MU to the entire campus. I also continue to with Adam Mirza on his new music project AMP. 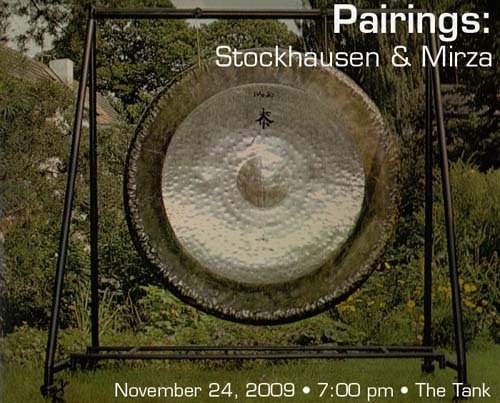 Last spring, we presented an electroacoustic concert featuring the music of Jonty Harrison, and this fall we are organizing a concert as part of a four-part series entitled Pairings. November 24, 2009 @ 7 p.m. 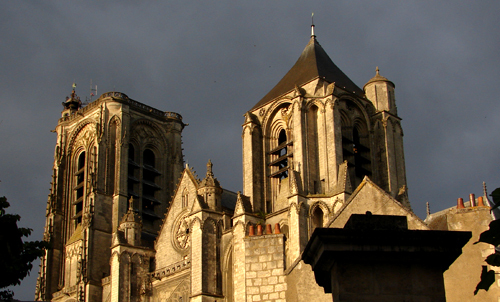 The above photo is of the Saint Étienne Cathedral in Bourges, site of the Sythèse Festival. This year, I had the pleasure of presenting my work Earth and Green as part of the festival. Earth and Green continues to be well-received as the work was also chosen as a finalist in this year's SEAMUS/ASCAP Student Commision Prize. SEAMUS will also be releasing the work on Volume 18 of the Music from SEAMUS CD series, which should be available beginning in the spring of 2009. I also recently completed a collaboration with choreographer David Justin, cellist Leanne Zacharias, and dancer Rosalyn Nasky entitled Fray, which was premiered at the Big Range Festival in Austin, Texas. For those living in Austin, I am selling all of my furniture to prepare for my move to Boston. I put together a page with prices and descriptions. Check it out if you are looking for some inexpensive furniture (bookshelves, desk, bed, etc...). update: All items are now sold. 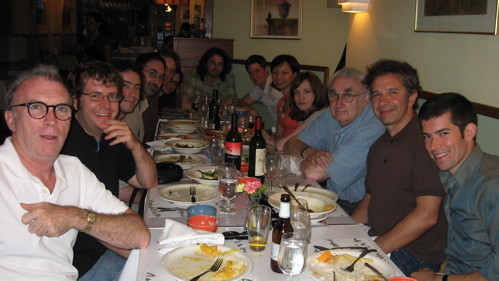 This past summer, I had the pleasure of participating as a fellow in the 2007 Composers Conference at Wellesley College. Working with the terrific musicians, Jim Baker, Pablo Ortiz, Martin Brodie, Mario Davidovsky, and the other composition fellows was an outstanding experience for both the mind and the ear. During the conference, my new work, Handwoven for 14 players, was premiered. I am back in New York after performing and participating at the Orford Sound Art Workshop. During this trip, Leanne Zacharias and I are presenting Voice-Leading at a small venue in the garment district. Drawing from interviews with musicians, artists + audience members, Voice-Leading is an intimate performance piece exploring the experience of music + concert rituals associated with art music. The work's main thread is dialogue + it demands close listening. As a living installation, eight loudspeakers blend radiophonic interview clips + electroacoustic interludes with live acoustic moments. The result connects ideas to sounds — everything from house concerts + the Flaming Lips to church + the Chicago Symphony. I am excited to share that I received a residency prize in the International Competitions of Electroacoustic Music and Sound Art - Bourges for my composition, Earth and Green.